If you need a book that relates the core principles of quantum mechanics to modern applications in engineering, physics, and nanotechnology, this is it. Students will appreciate the book's applied emphasis, which illustrates theoretical concepts with examples of nanostructured materials, optics, and semiconductor devices. The many worked examples and more than 160 homework problems help students to problem solve and to practise applications of theory. Without assuming a prior knowledge of high-level physics or classical mechanics, the text introduces Schroedinger's equation, operators, and approximation methods. Systems, including the hydrogen atom and crystalline materials, are analyzed in detail. More advanced subjects, such as density matrices, quantum optics, and quantum information, are also covered. 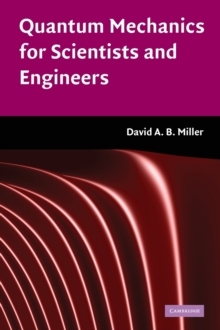 Practical applications and algorithms for the computational analysis of simple structures make this an ideal introduction to quantum mechanics for students of engineering, physics, nanotechnology, and other disciplines. Additional resources available from www.cambridge.org/9780521897839.